Mrs. Titus is my grandmother's friend. I have no first name, no information about how she came to know Mrs. Titus but I believe they must have been good friends because Gramma's album has nearly as many photos of Mrs. Titus as of any other one family member. My guess for a date of this photo is the early to mid-1910s. I notice that the house number if 222. If a census taker recorded house numbers it could be a clue for the address but finding Mrs. Titus's first name and anything about her feels like searching for a needle in a haystack. It's fun to muse on those old relationships. 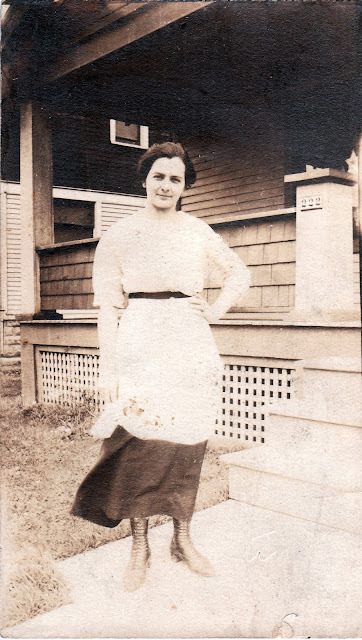 I found a picture of a Mrs. Rosekranz in my late mother's album who an uncle later identified as the minister's wife. It is fun and it's especially helpful when the individuals are identified, at least by name, in the old albums. Thank goodness you had someone to ask about the people in your mom's album!